A little known chapter of Johnny Cash’s recording career unfolded in 1964 during the making of his “Bitter Tears” album, a work that was profoundly pro-social justice. In particular, this album championed the cause of Native Americans and its best-known song is probably Cash’s rendition of “The Ballad of Ira Hayes,” a powerful musical tale written by folk singer Peter LaFarge. I knew of this album but didn’t know the full story behind it until I recently read a book called A Heartbeat and A Guitar – Johnny Cash and the Making of Bitter Tears by Antonino D’Ambrosio. 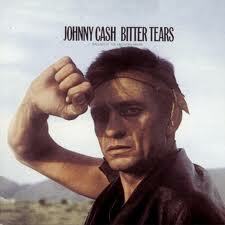 As the author points out in this engaging history, Bitter Tears was music by a Johnny Cash inspired to activism by the injustices he saw around him, years before he performed at Folsom Prison or sang “The Man in Black,” and years before the American Indian Movement gained real national visibility. Q. What in particular spoke to you about this album? What was compelling enough to make you want to spend what I can only imagine was a substantial amount of time researching and writing this book? A. It was clear that Cash was doing something very profound here at the height of his career. Cash offered a definitive anti-war statement, which still resonates today. Yet he was also speaking to the human condition and using his music as a creative response in active of pursuit of the most important thing art can do: telling the truth. All of this taken together, enflamed my creative consciousness setting me on a trip to not only discover why and how Cash made this record but investigate the larger unknown culture—politically, culturally, socially—that was shaping the U.S. and the world at the time. I knew that this was not a simple tale of Cash and a few musicians making a little known, controversial record at the height of his fame and success but rather a compelling example of how art and culture can be a powerful exercise in democracy. At the time, 1964, the U.S, was snared in conflict and social upheaval. I knew that Cash did not make this record in a vacuum or as some kind of vanity project meant to capitalize on the cultural fad of the moment. I felt compelled to do my best to place myself at the scene, which meant tying together the disparate threads that no one felt were connected. My research led me to weave together five narratives—the story of Cash, the little known folksinger Peter La Farge who wrote five of the eight songs on Bitter Tears, the folk revival, civil rights, and Native rights. Q. When did you realize that you were going to be weaving together multiple stories (Cash, La Farge and the American Indian struggle) and how did you tackle that? A. It was something that I intended to do from the start although not as intense and far-reaching in scope as it turned out to be in the final narrative of the book. In all my work—film, writing, and visual arts—I am always looking to tell a story that reveals our interdependence and interconnections as human beings. I felt that this worldview is something Cash successfully evoked throughout his career but never as he did with Bitter Tears (the record remains Cash’s only album where he dealt strictly with one human rights issue). From my perspective, this album serves as the fulcrum of his career but also the true mark of his humanity and compassion…Since the songs featured on the album revealed a long, often brutal history that had been so grossly distorted and neglected, I felt a responsibility to breathe as much life into the complexity of what fed not only into the recording but what was dominating the cultural and political consciousness at the time. In addition to the research or what my editor describes as “cultural investigation, I interviewed somewhere around 150 people and soon discovered that this book was just as much about the world today as it was about 1964. Q. My Carter Family “antennae” are always up and I noticed you reference the Carter Family quite a lot in this book. For someone who hasn’t read the book yet, can you briefly describe how they figure into this story? A. In my book they play two very important roles. The first is that in some significant ways they are the starting point for American music. They were exceptional musicians, songwriters, and singers. As Rosanne Cash recently discussed with me: “How else would those stories survive if not through those songs? It’s part of an oral tradition. It’s been proven that you remember something more easily when it’s got a melody. How else would we know about these people, and their families and what happened to them? Who was writing that down? AP Carter was.” Woody Guthrie revered them and there are some amazing discoveries highlighting this that I share in my book. Guthrie inspired so many musicians including Cash, who ultimately saw himself as first and foremost a folk musician. Yet it goes back to The Carter Family and for this reason I establish a unique folk family tree in the book: The Carter Family, Guthrie, Seeger, Dylan, Cash then onto Springsteen, the Clash, Public Enemy, etc. The second role The Carter Family plays in the book is in actually being a “family” for Cash. They provided much emotional support beyond the music for Cash as struggled with some very difficult issues throughout his life, particularly during the recording of Bitter Tears and the subsequent fight during the better part of 1964 to have the record heard on American airwaves. This support, particularly from Mother Maybelle, gave Cash much needed strength and courage to move forward. He also greatly admired Pop Carter’s work ethic, which is something he tried to emulate. It’s the most beautiful and universal story that we all share as part of the human family. A Heartbeat and a Guitar is a great read for anyone interested in the intersection of social issues and music. And of course, its a great look at artists taking creative and political risks.